Affording the vast natural beauty that Canada has to offer, Keltic Lodge Resort and Spa will captivate guests from the moment they arrive. 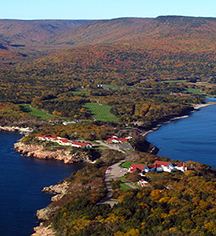 From the spectacular views of Cape Breton's finest fixtures, including the North and South Bays, from guestroom windows to the delicious food served up by an experienced and dedicated culinary team, the seasonally Keltic Lodge Resort and Spa will easily become a "home away from home" during a stay in Ingonish Beach. Keltic Lodge Resort and Spa is open seasonally, and typically welcomes guests each year beginning in mid-May and closes in mid-October. 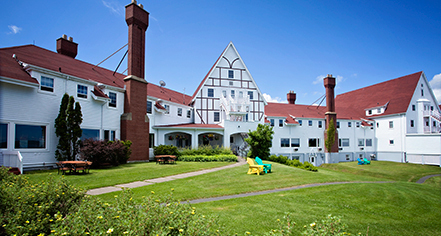 Keltic Lodge Resort and Spa, a charter member of Historic Hotels Worldwide since 2014, dates back to 1940. The golf course’s original designer, Stanley Thompson, has been ranked as the fifth most influential golf course designer in history, due largely to his work on his “mountains and ocean” course at the Highlands. Early Check-In/Late Check-Out: Late check out is available, depending upon availability. Hotel/Resort Fees & Taxes: This property is located within a state park. There is a park entry fee of $7 per person (not charged by the hotel). Parking: On-site parking: Available. Self-parking: Available; complimentary. Pet Policy: Service animals allowed: Yes. Pets allowed: Yes. Pet accommodations available in Oceanside Cottages only. Smoking Policy: There are several dedicated outdoor locations for smoking. All buildings are 100% non-smoking. Transportation: Limo or Town Car service available and may be arranged through the concierge; rates apply. Affording the vast natural beauty that Canada has to offer, Keltic Lodge Resort and Spa will captivate guests from the moment they arrive. Learn more about the History of Keltic Lodge Resort and Spa .